To study the effect of aging on astigmatism in adult Japanese. Measurements of refractive errors and keratometry were performed on 2161 randomly selected subjects (aged 40–79 years). The relation between age and the net value in diopters (D) of astigmatism was evaluated with a trend test. The relation between age and the polar value was also examined by linear regression analysis. 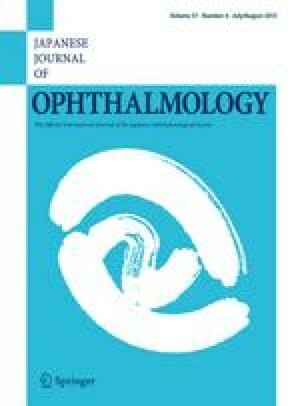 The mean (±SD) value of total and corneal astigmatism was −0.97 ± 0.72 D and −0.86 ± 0.63 D, respectively, and the net value of both increased with age (P trend < 0.001). The prevalence of either type of astigmatism also increased with age, according to the Cochran-Mantel-Haenzel test (P < 0.0001 for total and P < 0.01 for corneal astigmatism). The prevalence of against-the-rule astigmatism increased with age for either type of astigmatism (P < 0.0001 for total, P < 0.0001 for corneal). According to the analysis of polar values by age, the regression coefficient (±SE) for total and corneal astigmatism was −0.024 ± 0.002 (P < 0.0001) and −0.028 ± 0.002 (P < 0.0001), respectively. There was no statistical difference between these two regression coefficients. The prevalence of astigmatism increases and the axis turns to against-the-rule with age. The result of the linear regression analysis indicates that the age-related change in astigmatism is mainly associated with changes in the cornea.